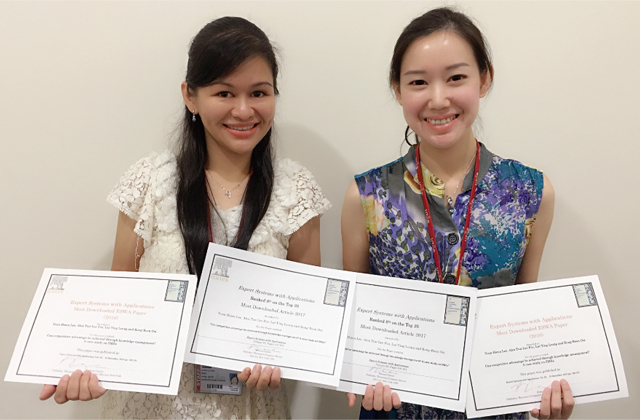 UTAR Faculty of Business and Finance (FBF) academics Dr Lee Voon Hsien and Leong Lai Ying added another feather in their caps when their research paper was acknowledged as “Most Downloaded Expert Systems with Applications (ESWA) Paper (2016)” and “Ranked 8th on the Top 25 Most Downloaded Article 2017” by Elsevier (USA)’s ESWA journal. Co-written with former FBF academic Alex Foo Tun-Lee and Prof Ooi Keng Boon of UCSI University, the paper titled “Can competitive advantage be achieved through knowledge management? A case study on SMEs” had also earned the quartet the Honourable Mention Award at the Technology Innovation and Industrial Management (TIIM) Conference 2014 previously. Buoyed by a sense of accomplishment, both Dr Lee and Leong extended their utmost appreciation to their co-writers for being professional and inspirational. They also dedicated their success to UTAR and expressed their pride to be affiliated with the University. “UTAR’s focus to excel in R&D and commercialisation has spurred us to be better thinkers, writers and researchers,” they remarked. The duo also attributed their success to the Chartered Institute of Management Accountants (CIMA) for its research grant awarded in 2013, which financed their 12-month research initiatives. Explaining the significance of their research, Dr Lee said, “Today’s agile economy entails organisations to be constantly building up their capabilities and capacities for the future. SMEs, in particular, need to embrace the knowledge management strategy, that is, to identify, create, share, retain, and utilise knowledge in order to spur creativity. This will also release new ideas that could unlock successful technological creation.” The principal researcher also added that effective application of both knowledge management and technological innovation will equip firms to be in a formidable position that will carve out a competitive edge for the local SMEs. Concurring with Dr Lee, Leong remarked that she is confident that this research topic will remain hot and widely discussed in the field of knowledge management. “This is because competitive advantage and technological innovation have always been the main components of business success but not much have been discovered in the context of SMEs thus far,” the senior lecturer mentioned. ESWA is a refereed international journal with the impact factor of 3.928. It is currently ranked number 1 in the Google Scholar h-index listed under the top publications of Artificial intelligence. “Can competitive advantage be achieved through knowledge management? A case study on SMEs” can be read and downloaded here. Click to view the certificates of “Most Downloaded ESWA Paper (2016)” and “Ranked 8th on the Top 25 Most Downloaded Article 2017”.